Yesterday my fiance Vanessa and I received a letter from some friends of my family, saying that they had found a new church and wanted to invite us to come. To some, the letter might have seemed well-intentioned and innocuous, but I couldn't help feeling a bit offended by it. 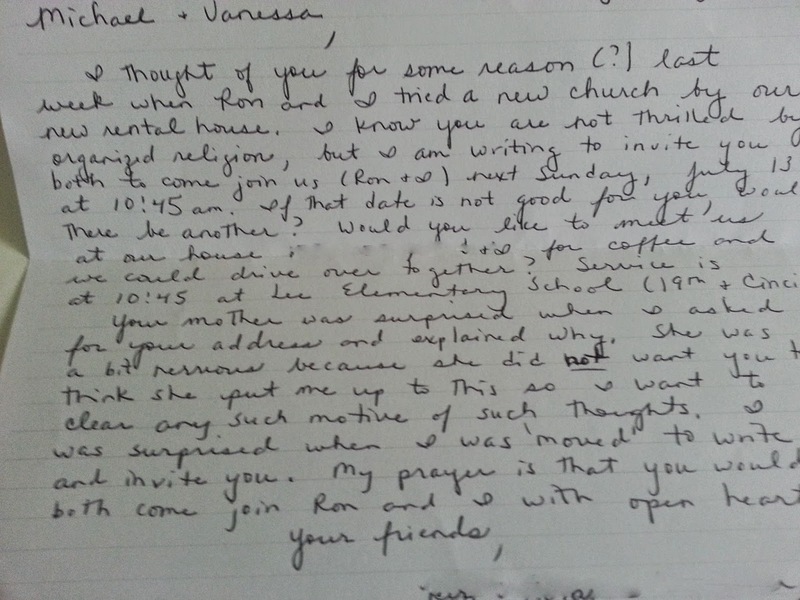 The text is probably not very clear, but the gist of it is that they found a new church and wanted to invite us. Now, they know that Vanessa and I are non-religious. In this case, the wife asked my mother for my and Vanessa's address, and explained why. Knowing how touchy the subject can be, my mother was wary, which is why the women who wrote the letter emphasized that my mother didn't put her up to this. In her words, she was "moved" to write me. Now, I'm sure in some people's universes this is a kind gesture. But here, I just felt it was somewhat rude by virtue of being insensitive to my and Vanessa's religious beliefs (or lack thereof). I'm sure they would feel the same if a Muslim friend invited them to come to their mosque with "an open heart". Vanessa and I are not lapsed Christians. We don't secretly believe in the Christian god deep down. We're non-believers, period. We think the claims of the Bible and Christian theology are false. That's not the kind of thing that you can waltz into a church service and change because you hear a message that "touches your heart". Generally speaking, there are two reactions when people find out I'm an atheist. 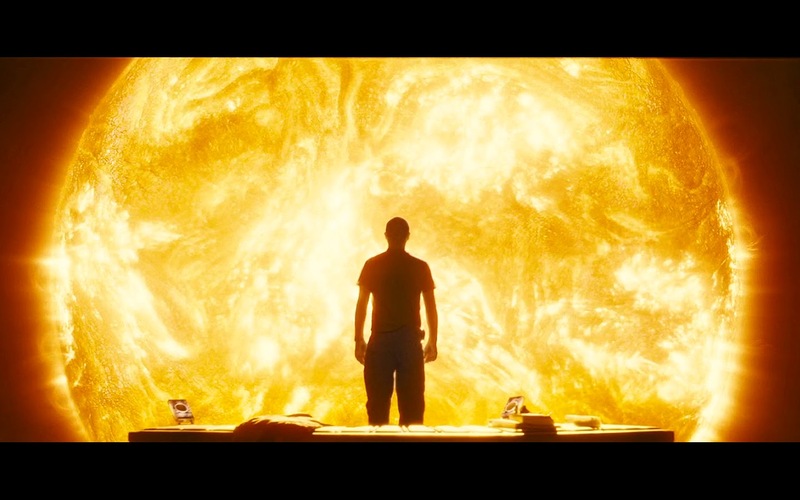 The most common is defensive: Why don't you believe in God? Where did the universe come from? How do you explain __________? So you think everything is here just by random chance? These types of questions are consistently parroted out as though it's the first time I've heard them, or I've never thought about them. The other reaction is like this letter, reflecting a somewhat detached sense of concern. I'll be praying for you. Will you consider coming to church with us? The reason it's mildly offensive to me is that they didn't take the time to try to understand our religious beliefs. They know we're non-believers and we don't go to church, but they don't have any real understanding of why, or even what our non-belief really entails, simply because they haven't asked. Interestingly enough, when Vanessa and I went to pre-marital counseling, the pastor (my parents' pastor) asked us about our beliefs. But, surprisingly, it was genuine curiosity. He didn't try to debate us, and he didn't invite us to a church service. If even a pastor can approach the issue with grace, why is it so hard for so many others? I don't wish to disabuse anyone of the comfort and meaning they may find in their religious beliefs. Sure, I like discussing my views on things — which is why this blog exists — but reading this blog is optional. I don't print out the posts and send copies to all my Christian friends. I don't broach the subject in my day to day interactions with others. I'm very much a live and let live kind of person. And having gone through the process of deconversion and knowing first-hand how difficult it is, it'd be nice if more people who were concerned about my religious beliefs would approach it with a sense of respectful curiosity and humility, rather than debating me or inviting me to church. I wrote a letter back, in which I said that we "respectfully decline". My fiance and I are happy, fulfilled non-believers and we have neither the need nor the desire for religion in our lives — especially the religions of Western monotheism. I've thought for a long time that is something that doesn't sit well with people of faith. They think we have a God-shaped hole in our heart, or that we're not really atheists. Well, sorry to disappoint. Deconverting has deepened my sense of purpose and my sense of morality, made me appreciate my life much more deeply, and injected me with a renewed sense of awe and wonder at the universe. Even if I could go back, I wouldn't want to.